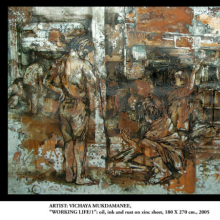 Celebrated Thai artist Vichaya Mukdamanee presents a solo exhibition entitled “Strive To Fail” at the National Gallery Bangkok. The exhibit will include performance art, video art, photographs, drawings and paper and canvas paintings created over the past three years as he pursued a doctorate at the University of Oxford. Dramatic, intellectual, inspiring, exciting: an exhibition worth seeing.